We also handle tune ups, fuel injection service, shocks, CV joints, batteries, emissions, alignment, oil changes, and factory scheduled maintenance. There’s a world of things we can do to ensure your car runs as it should. 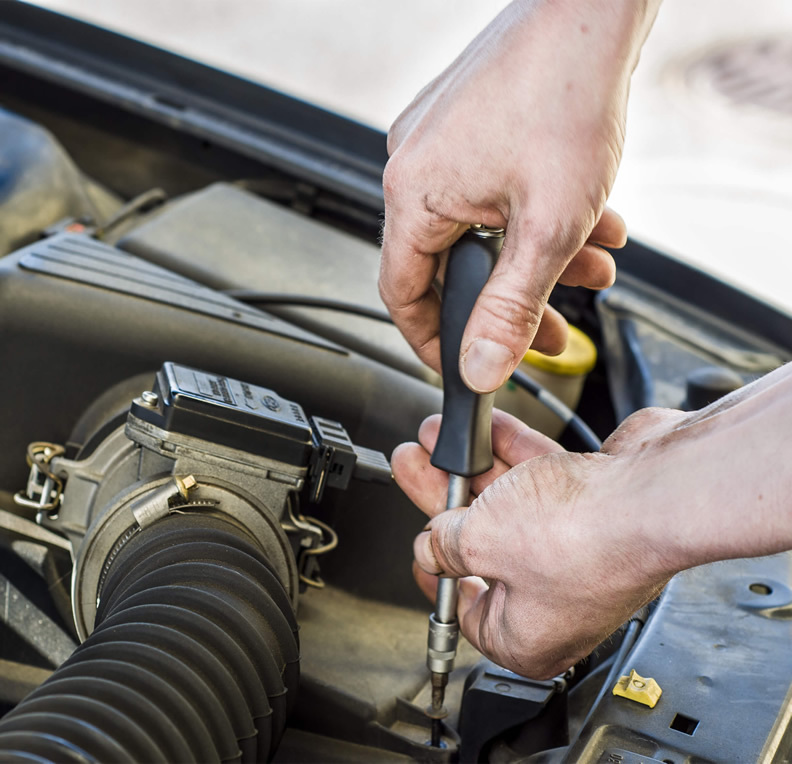 For Complete Auto Care, See Crawfordville Auto Repair and Tire Today! We offer a full line of mechanical services from recommended 30k-60k-90k preventive maintenance service, to major engine repair. Today’s cars and trucks have electronic controlled ignition system which offers quicker starts, better fuel economy and longer engine life when everything is working the way it was designed to. But when there are problems it takes trained technicians with a full understanding of the vehicle components and the diagnostic equipment needed to make the correct repairs. Many of the complaints in Drivability that we see are related to the Electronic Ignition system such as Coil Misfires, Coil Boots, Wires, Spark plugs and Distributor related problems. Your vehicles fuel system is a complicated system with an electronic Fuel Pump usually located in your gas tank that not only pumps the fuel but is required to do so at high pressure in order for the Fuel Injectors to operate the way they were designed. On the way from the tank to the fuel Injectors the fuel passes thru a filter which purifies the gas reducing contaminates which can reduce the efficiency and operation on the Fuel Injectors. Over time this will reduce your vehicles gas mileage, prematurely wear out the Fuel Pump and may eventually cause the vehicle to experience starting problems. Designed to maintain the relationship between your vehicles body and the wheels. The steering system and suspension work together to provide vehicle control as well as absorbing tough road conditions, such as potholes. Maintaining control of your vehicle is a must and the condition of your steering gear, suspension components and tires are all important factors in doing so. Many of today’s vehicles are equipped with a Timing Belt which replaces a timing chain. The Timing Belt is vital to your engines operation; it keeps the Crankshaft in exact timing with your Camshaft of Camshafts allowing the engine valves to open at the precise time allowing fuel and exhaust to move in and out of the combustion chamber. Over time the Timing belt starts to stretch and crack and can eventually brake if not replaced causing major engine damage. Your vehicles owner’s manual will give you replacement guidelines for replacement usually between 60,000 and 105,000 miles. Your vehicle may only have one belt usually called a Serpentine Belt that runs your Alternator, Power Steering, Air Conditioning and Water Pump, and as the name implies it “Serpentines” its way up around and thru all these pulleys. Because you have only one belt doing all the work it is critical to have it inspected on a regular basis and replaced when needed. The typical life of a Serpentine Belt is between 50,000 and 60,000 miles depending on driving habits. Older vehicles use “V” Belts which usually operate one accessory item each and your vehicle could have 2 or 3 V-Belts. Just like with the Serpentine belt it is important to have the inspected regularly and replaced when they show signs of wear. Most vehicles have 2 Radiator Hoses and at least 2 Heater Hoses and may have more. Because they are made of rubber and are exposed to extreme temperatures they can become weak, swollen and cracked and need inspecting on a regular basis and replaced when needed. Ignoring damaged, swollen or old Hoses can lead to failure which in turn can cause your engine to overheat possible causing major engine damage. Checking your tires on a regular basis will help extend the life of the tire and reduce the risk of failure. Running the correct tire pressure not only impacts ride, control and fuel economy it also extends the life of the tire. Many of today’s cars and light trucks have “Tire Pressure Monitoring System” also known as TPMS which electronically monitors tire pressure while you drive and will alert you when one of your tire pressures drops below the recommended pressure. Checking your tires for uneven wear is also important in extending tire life; an alignment problem can quickly eat up a good set of tires creating unneeded expense. Replacing your tires when they are worn down to the wear bar indicators is important and will help avoid loss of control issues. Rotating and balancing your tires every 6,000 to 8,000 miles is recommended this is also a good opportunity to have the air pressure checked and wear problem identified. The alignment of your vehicle is an important step in maintaining optimal control and preventing uneven tire wear. Most of today’s front wheel drive cars require not only front wheel alignment but rear wheel alignment as well. Keeping the tires operating parallel with each other allows the tires to meet the road at the correct angle maintaining control in all weather conditions. Loose front end components such as Ball Joints, Tie-Rod Ends, Pitman Arm, Idler Arm, Sway bar Bushing, Shocks and Struts and Wheel bearings can cause rapid tire wear and control. Having your Alignment checked and adjusted is recommended annually as well as after replacing tires or after hitting large potholes. Probable the most important safety item on your vehicle. Your brake system consists of Brake Master Cylinder, Brake Booster, Brake Lines, Calipers, Wheel cylinders, Brake Pads and Brake Shoes all of which need to be in top working condition to avoid Brake problems. Symptoms of Brake troubles could be, squealing/grinding, chirping, vibrating, pulling, spongy pedal, no pedal and Brake warning dash light just to name a few. If you are experiencing any of these problems you need to have your Brake system checked immediately. With the heat we experience during the summer months it is a must to have your Air Conditioning System operating at maximum performance. But did you also know that in the winter time when you select the Defrost mode your Air Conditioner comes on? For your Defrost to work correctly the Air Conditioner comes on and pre-freezes the air before it goes thru the Heater Core this removes moisture from the air making the air dryer and the Defrost work more efficiently. It is common for automotive Air Conditioning systems to lose Freon over time; Freon is the active ingredient that allows cooling to take place. Today’s vehicles are very finicky when it comes to having the correct amount of Freon, only being a few ounces low can make all the difference in providing cool air. Having your system inspected and recharged is recommended any time you notice the air not cooling as well as it should or each spring. Always have your systems checked and serviced by a certified A/C Specialist trained in recovering and charging Freon. Freon contains Floral Carbons which are said to damage the ozone layer in our atmosphere so responsible handling and recovering practices are very important. Your vehicles Battery is what stores electrical energy and the Alternator is what keeps it charged. Today’s vehicles use a lot of electricity to start and operate. Almost every system on your vehicle has electrical needs such as; starter, lights, ignition, fuel pump, air conditioning, wipers, electric windows, cooling fan, blower motor, door locks, power steering, ABS brakes, power seats the list goes on. So the need to have a good Battery and Alternator is critical, most battery’s last between 4 and 6 years but the older a battery gets the less charge it holds and the more it works the Alternator. So ignoring a weak battery just to get a few more months out of it may end up costing you more in the long run due to prematurely wearing out the Alternator. When you notice the first signs of your battery not starting the car as fast as it should or a Battery light on the dash you need to get the system checked to minimize the chance of a brake down. All cars and trucks built in the last 20 years are equipped with a Malfunction Indicator Light (MIL) or better known as the Check Engine Light. This light is designed to come on when your vehicles on-board computer receives a signal from one or more of the many engine and transmission system components being monitored by the computer. New cars can have as many as 80 micro processors working together to provide information to the computer which in turn sends out signals telling each system what to do based on the information received. These processors are monitoring things such as Fuel/Air mixture, Timing, Shifting, Steering, Air Conditioning, Emissions and the list goes on. The Check Engine Light is telling you that you need to get your vehicle scanned by a Technician using a computerized hand held scanner to determine what has caused the light to come on. Many times it can be as simple as a loose gas cap or a dirty air filter, but it can also more serious problem which could cause a break down. It is always advised to have the problem checked before it becomes a bigger problem leading to more expensive repairs. Tune-up’s on today’s electronically controlled vehicles is a bit different than it was 30 years ago. Because the engine systems are run by a computer they run much more efficiently extending the life of spark plugs and ignition parts. Because these systems are so complex in their operation it is important to have them serviced and maintained by a qualified technician. If your fuel economy drops or you notice rough idling, hard starts or sputtering you may be in need of a Tue-up. Following the owner’s manual recommendation is the best way for you to keep up with your vehicles Tune-up needs.